With only the most rudimentary eyes, in environments full of turbulence and surge, small animals in the sea make their way around, track what is going on, seek each other out. 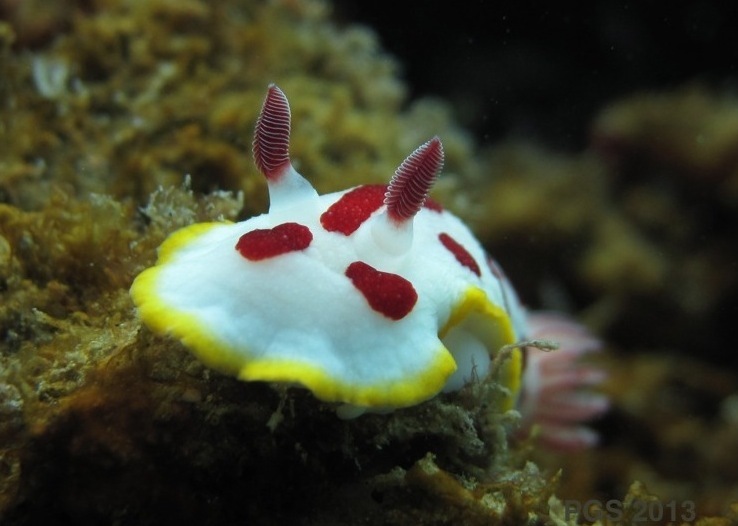 The animal above is a nudibranch, Chromodoris splendida. Its eyes are tiny, invisible in the photo. The tall stalks are rhinophores, organs of smell or taste, detecting traces of chemicals in the water. I found this nudibranch wandering along high on a rock. 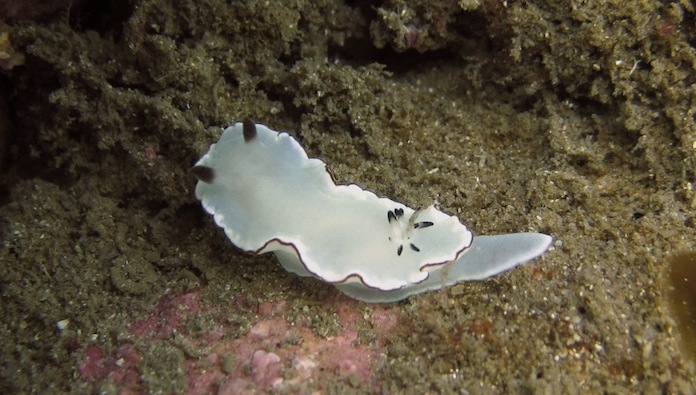 Soon after I arrived it turned, and started making its way down the rock face towards a smaller Chromodoris below. Its path led directly to the other. 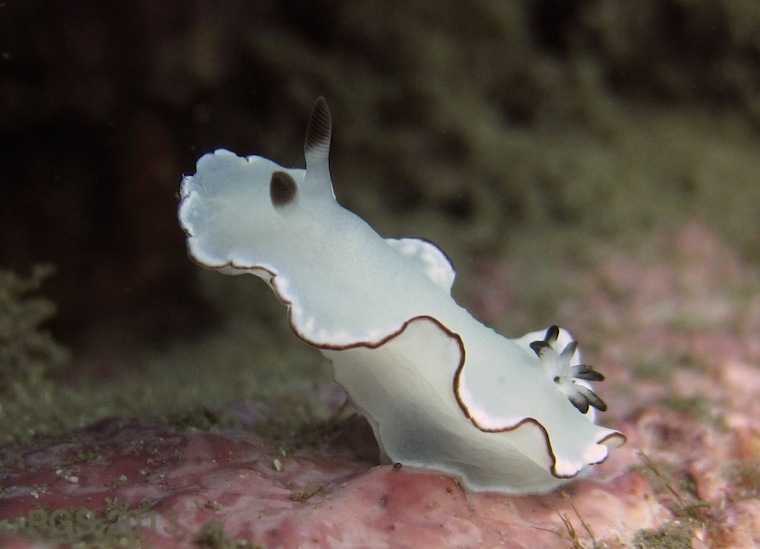 This is a slow journey for a nudibranch. It took 8 minutes from turn to arrival. When it arrived they mated, in their hermaphroditic way. The eyes of this animal are too simple to focus an image, even if it could see that far, but it’s also hard to imagine following a chemical trace in the water so accurately. That patch of ocean is far from still, with constant slight currents and surge. You can see bits of debris being wafted about in the photos. 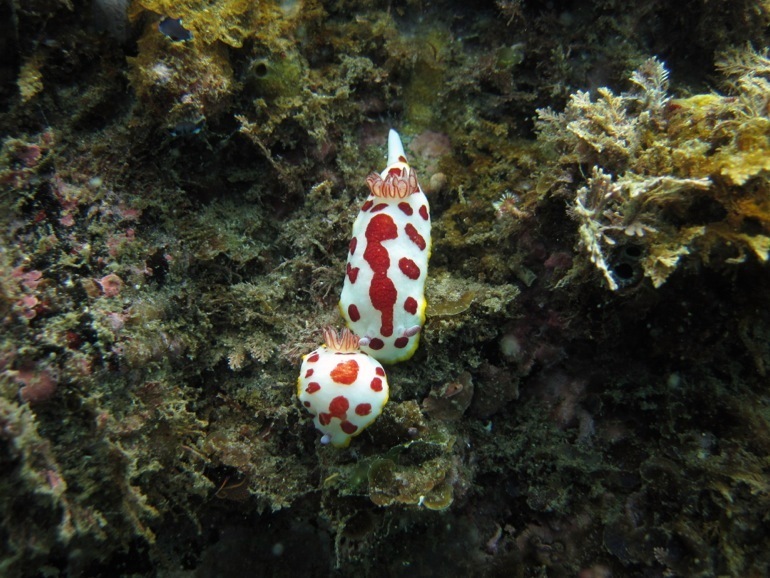 The nudibranch would have to be extremely sensitive to the exact concentration of the chemical to pick out the direction to follow. 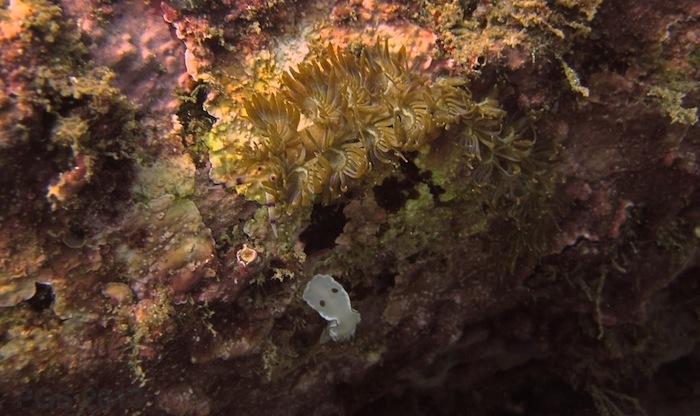 I suppose it’s possible that the upper nudibranch was following a chemical trail on the rock face left by the other as it made its way down, or using the trail plus the traces in the water. If so, the lower individual must have headed in a very straight line to that spot; I suspect, instead, that this shows the sensory sophistication of the rhinophores, and the tiny nervous system below them. 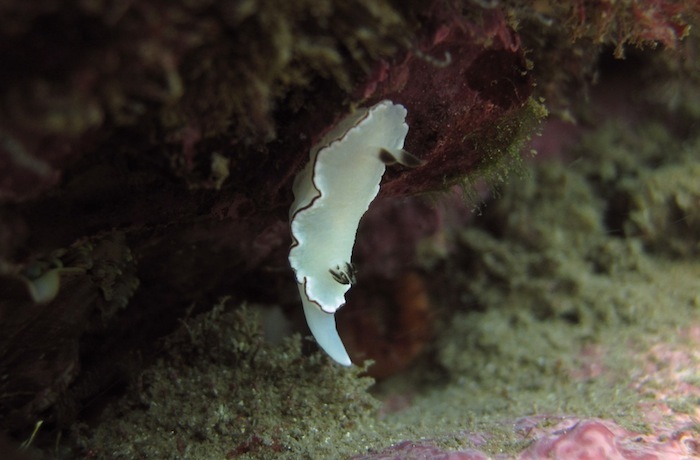 I saw a very small nudibranch of a different species, Glossodoris angasi, moving around below another rock face. … and made its way directly up the rock. It was heading straight for several nudibranchs of another species: the larger and psychedelically plumed Pteraeolidia ianthina. 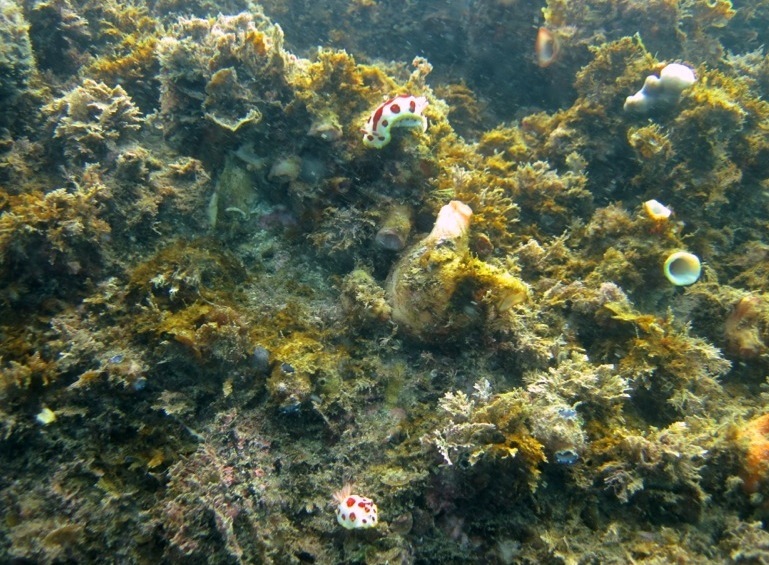 Could it detect that some nudibranch was there, but not distinguish the species? Was it tracking something else higher on the rock, and just happened to pick a path that went straight for the other nudibranchs? Either way, the craning of the head and the definite turn suggested that it was following a chemical trace in the water. What would happen, though, when the two species met? They met, head on…. and did absolutely nothing. They touched briefly, and the Glossodoris turned slightly and continued on its way. About the eyes: where are they? David Scheel pointed me here to help sort out what is going on. In one shot of a Chromodoris, eyes can be seen under the fringing skirt at the front of the head. 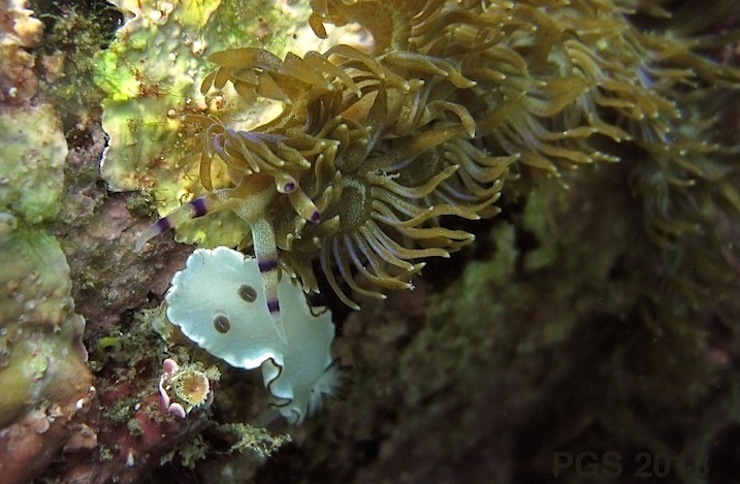 He says that many nudibranch eyes are subcutaneous (buried under the skin), however, and cannot be seen. About tracking: a philosophical treatment here.